In a small saucepan, I sauteed two smashed cloves of garlic in maybe 1/2 tablespoon of oil until fragrant. Remove the garlic and add some good soy sauce (we used Kikkoman as that’s what’s in the pantry) and some good vinegar (coconut or cane vinegar or cider if you are abroad and that is more accessible) and some freshly ground pepper. When some of the acidity has cooked off, add about 1/2 tablespoon of cornstarch just to thicken the sauce a bit. Balance the flavors to your liking. After a couple more minutes on the heat, the sauce should be just slightly thickened and glistening. If your sauce seems too intense, add some water to thin it a bit. In the meantime, I put a pan over medium heat to heat the pork chops through. Don’t brown them, just heat them through. You could also do this in an oven. 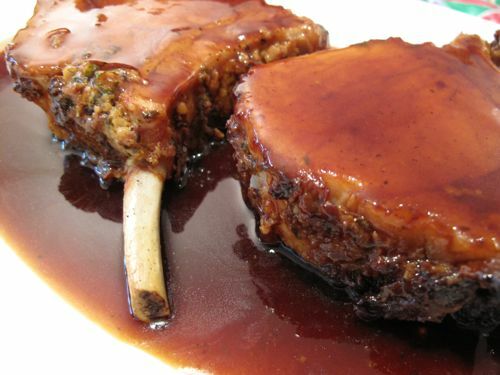 Just before serving, pour the instant “adobo sauce” over the chops and you have this very chi-chi looking dish. You would be forgiven if you thought the sauce was some fancy reduction that took a while to make. Just one bite and I promise you will wonder why you haven’t done this before. The instant sauce is a great proxy for a real adobo. Sure the meat isn’t flavored the way through, and sure this is a serious shortcut. But with some rice and your eyes shut, you could be anywhere in the world and have a taste of home. And better yet, if you live in an apartment or close quarters elsewhere on the planet, this version has a far less offensive smell quotient than a long-stewed adobo. And oddly, bits of the mustard and herb breadcrumb topping melded brilliantly with the adobo sauce. So simple and yet so delicious. hayyyy….and i just had dinner. delata vienna sausages =( i want this!! looks delish MM. pork chop shaped like a battle axe. this can be a great weapon for me. That looks great! Can you tell me the ratio of soy sauce to vingear that you use? My adobo always comes out too salty or too sour. 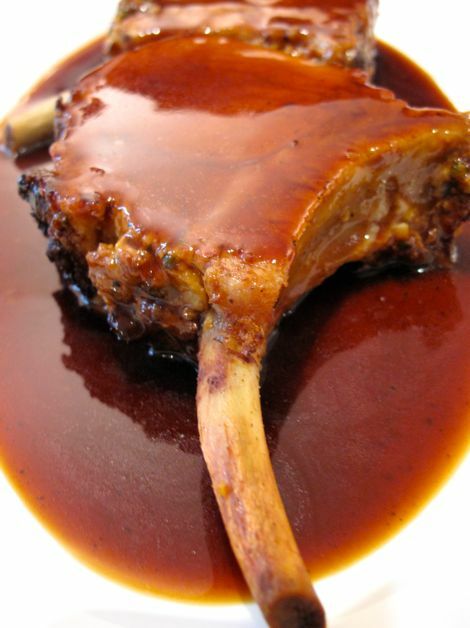 That’a a seriously good looking chops you have there! This ‘instant’ adobo is something I have to try soon! I think you may have give some of our upscale Filipino restaurants and idea. soooooooooooo,delicious yet i didnt try.but i promised that i will do it tomorrow.i salute you marketman!more recipes to post ha? just had adobo yesterday but yours looks more scrumptious. Way back I did this recipe by necessity. My hubby had marinated chicken drumsticks in vinegar/soysauce/garlic/bayleaf (usual adobo mixture), which he then grilled. It came out a little dry and he told me he wanted some sauce poured on top of it. I was so much in a hurry doing other dishes (visitors started arriving), that I just boiled the marinate and added a little cornstarch to thicken it. And when we plated it, I poured the Ã¤dobo sauce” on top and sprinkled some dried red pepper flakes. The dish came out a hit. Ummm.. your post today just gave me an idea that I might do it again this for our church potluck this weekend. I can grilled the meat at home, and heat the sauce at their kitchen. Thanks as usual. hmmmm…. the SAUCE from paksiw na pata OR lechon should then be just as good! this is a great idea! never thought to make adobo “sauce” thickened with cornstarch. the possibilities are endless. by the way, saw you in whitespace yesterday mm! you were lining up at the italian station and wore red shorts and a white polo.i was too shy to approach you lest you thought i was a stalker, haha. anyways, the mm sighting and the yummy fores buffet spread made my day. also brought home a lot of stuff for christmas gifts. Rebecca, definitely start with more vinegar than soy. But usually, the problem is bad vinegar to begin with. If you are in the States, try a real apple cider vinegar. And good soy sauce. Let the vinegar boil off the acid? so it isn’t so harsh. Adjust soy until the sauce meets your taste preferences. Modulate with water if necessary or you could use a bit of homemade broth/stock. This is such a good idea that I could use over and over again especially when I’m too lazy to cook. I can use this for leftover KFC chickens, for sure! Thanks…. Thanks for the tip, MM! I’ll try it. adobo sauce is the greatest! i love it over steamed or tofu and spinach! MM, you french your porkchops? nice-looking! about the frenched chops, i just read the earlier post about the rack. thanks, MM! Ohhh that is perfect for dinner tonight. MM, I cooked this for my wife yesterday using two double thick loin pork chops. My wife simply loved it as well as I. My wife is Filipino and I’m a Black American. I do the majority of the cooking in our household and therefore must also cook Filipino dishes. My wife said that by far this was the best tasting Filipino dish I’ve cooked to-date! The sauce is absolutely great and the pork was fantastic. These look fantastic and your photo is just beautiful!